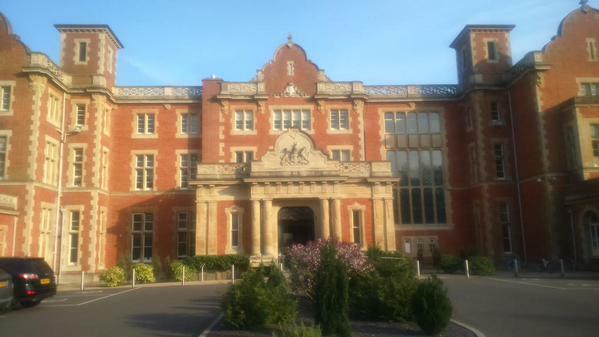 Here I am in Easthampstead Park Conference Centre after a hard day being away at an awayday. In fact we’ve been so busy that I’ve only just checked into my room (actually it’s a suite) and shall very soon be attempting to find the bar so I can have a drink. I’m parched. I’m told it is very close to Broadmoor, the famous high-security psychiatric hospital, although I’m sure that wasn’t one of the reasons for choice of venue. I have to attend quite a few of these things for one reason or another. This one is on the Future and Sustainability of the South East Physics Network, known as SEPnet for short, which is a consortium of physics departments across the South East of England working together to deliver excellence in both teaching and research. I am here deputising for a Pro Vice Chancellor who can’t be here. I’ve enjoyed pretending to be important, but I’m sure nobody has been taken in. Although it’s been quite tiring, it has been an interesting day. Lots of ideas and discussion, but we do have to distil all that down into some more specific detail over dinner tonight and during the course of tomorrow morning. Anyway, better begin the search for the bar so I can refresh the old brain cells. Every now and again I’m at a loss for something to blog about when a nice press release comes to the rescue. This announcement has just gone live, and I make no apology for repeating it here! UPDATE: You can now read the University of Sussex take on this announcement here. The South East Physics network (SEPnet) and HEFCE are delighted to announce their plans to invest £13.1 million pounds to sustain physics undergraduate and postgraduate teaching provision, and world class research facilities, staff and doctoral training over the 5 years up to 2018. HEFCE will provide £2.75 million to maintain and expand the network, to establish a dedicated regional graduate training programme for physics postgraduate students and address physics specific issues of student participation and diversity. On top of the HEFCE contribution, each SEPnet partner will support and fund programmes of Outreach, Employability and Research. The South East Physics Network (SEPnet) was formed after receiving a £12.5 million grant from HEFCE in 2008 as a network of six Physics departments in South East England at the Universities of Kent, Queen Mary University of London, Royal Holloway University of London, Southampton, Surrey and Sussex. The Science and Technology Facilities Council and Rutherford Appleton Laboratory provided additional funds and resources for collaborations in particle physics and astrophysics. The University of Portsmouth joined in 2010. The Open University and the University of Hertfordshire will join the network effective the 1st August 2013. SEPnet Phase One has been tremendously successful for the partners in SEPnet and for physics in the region. The Outreach programme, regarded as an exemplar for collaborative outreach, uses the combined knowledge and resources of each partner to provide greater impact and reach and demonstrates that the whole is greater than the sum of its parts. It has succeeded in effectively exploiting the growing national interest in physics through its wide range of public engagement and schools activities. There has been a substantial increase in applications and intake for physics undergraduate courses and undergraduate numbers are now 90% higher in the SEPnet physics departments compared with 2007 and applications up approximately 115% – well above national trends. enhance research environment diversity through engagement with Athena SWAN and the IoP’s Project Juno. Expansion of its employer engagement and internship programmes, widening the range of work experiences available to enhance undergraduate (UG) and postgraduate (PG) employability and progress to research degrees. Enhancement of its Outreach Programme to deliver and disseminate best practice in schools and public engagement and increase diversity in physics education. The inclusion of new partners The Open University and University of Hertfordshire broadens the range of teaching and postgraduate research in the network. The University of Reading, about to introduce an undergraduate programme in Environmental Physics (Department of Meteorology), will join as an associate partner. A key part of the contributions from each partner is the provision of “SEPnet PhD Studentships”, a programme to attract the brightest and best physics graduates to engage in a programme of collaborative research within the network, of joint supervision and with a broad technical and professional graduate training programme within the SEPnet Graduate Network. One of the interesting bits of news floating around academia at the moment is the announcement that my current employer (until the end of next week), Cardiff University is to join forces with the Universities of Bath, Exeter and Bristol in an alliance intended to create a ‘critical mass of knowledge’ and help Cardiff ‘better compete for more research income’ (apparently by pretending to be in England rather than in Wales). How successful this will be – or even what form this alliance will take – remains to be seen. There’s been a lot of gossip about what inspired this move, but it’s not the first attempt to create a collaborative bloc of this kind. Last year five universities from the Midlands announced plans to do something similar. The “M5” group of Birmingham, Leicester, Loughborough, Nottingham and Warwick got together primarily to share infrastructure in order to help them win grants, which is probably what also lies behind the Cardiff-Bath-Exeter-Bristol deal. Of course there are also a myriad alliances at the level of individual Schools and Departments. I’ll shortly be joining the University of Sussex, which is a major player in SEPNET – the South-East Physics Physics Network which was set up with help from HEFCE There are other such networks in England, as well as SUPA in Scotland, funded by the devolved Scottish Funding Council. Attempts to form a similar arrangement for Physics in Wales were given short shrift by the Welsh Funding Agency, HEFCW. The inability or unwillingness of HEFCW to properly engage with research in Wales is no doubt behind Cardiff’s decision to seek alliances with English universities but I wonder how it will translate into funding. Surely HEFCE wouldn’t be allowed to fund a Welsh University, so presumably this is more aimed at funding from the research councils or further afield, perhaps in Europe. Or perhaps the idea is that if GW4 can persuade HEFCE to fund Bath, Bristol and Exeter, HEFCW will be shamed into stumping up something for Cardiff? Sneaky. Anyway, good luck to the new “GW4” alliance. Although I’m moving to pastures new I’ll certainly keep an eye on any developments, and hope that they’re positive. The only thing that really disturbs me is that the name “Great Western Four” is apparently inspired by the Great Western Railway, now run by an outfit called First Great Western. My recent experiences of travelling on that have left a lot to be desired and I’m sure the name will have negative connotations in the minds of many who are fed up of their unreliable, overcrowded, overpriced and poorly managed services. They say a rose by any other name would smell as sweet, but so far this is only a name – and one with a distinctly questionable odour.